Home > Learn > The Basics > Alzheimer's FAQs > How can I afford Alzheimer’s services? Long-term care? 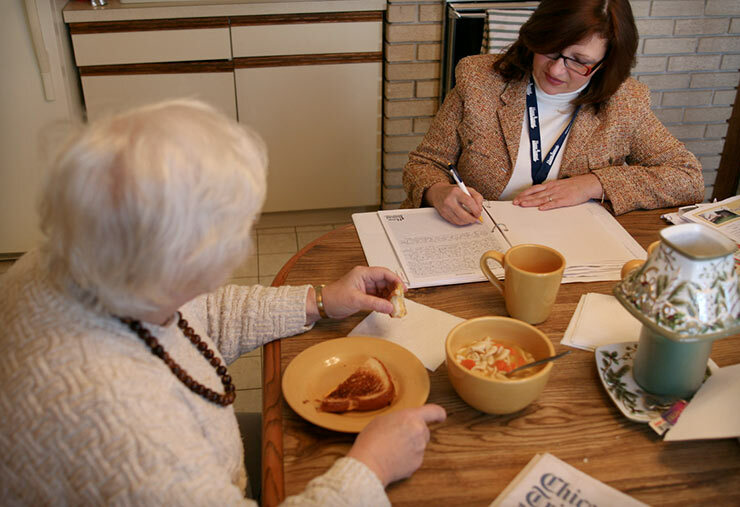 Costs for caring for a person with Alzheimer’s disease or other dementias can be high, but there are steps that families can take to use their resources wisely and identify sources of help. Any of us who have had a family member or friend with dementia understand the enormous physical and emotional toll of caregiving. It’s very tough watching your family member or friend lose memory, skills and abilities. But there is another challenge for families that isn’t talked about as much—the enormous financial toll of caregiving for a person with dementia. The national average hourly rates for home care workers is $19/hour. The national average daily rate for adult day services is $70. The national average monthly base rate in an assisted living community is $3,477. The national average daily rate for a private room in a nursing home is $239. Specialized dementia services are often more expensive. The bottom line is frightening. An early study of lifetime costs by R.L. Ernst and J.W. Hay suggested that families will pay $174,000 over time providing care, a figure that has certainly risen. What can a family do to cope with these costs? Here are some suggestions from Alzheimer’s care expert David Troxel. First and foremost, take stock of family resources and funds. Make sure that your family member’s legal and financial affairs are up to date, that you know where various accounts and funds are located, and that a trusted party receives a durable power of attorney to handle finances. Because persons with dementia can make bad decisions and even become victims of fraud, be vigilant in monitoring accounts and protecting remaining funds. Look for sources of help or untapped benefits. Individuals that are veterans may have veteran’s benefits that can be life-savers. Contact the Veteran’s Administration for help. A good source of information regarding benefits is an online service provided by the National Council on Aging at www.benefitscheckup.org. This reputable site can help with resources related to everything from medications, health care, food, utilities and more. Geriatric care managers are typically nurses or social workers who charge an hourly fee to help family caregivers. They may be able to bring their experience to the table and help you identify and become eligible for various services. Call your local Alzheimer’s Association chapter to see what other programs are available to help, for example friendly visiting programs, home delivered meals and other services. Travel the continuum of care. Community based and home services are usually cheaper than residential care. Day centers provide wonderful socialization for persons with dementia and are generally affordable. Starting out with in-home help every other day for four hours can be a life-saving way to give caregivers a break, while giving some stimulation and support to the person with dementia. When needed, an assisted living memory care program is generally much cheaper than skilled nursing. Long-term care insurance is highly recommended for everyone concerned about the cost of long-term care. Many Baby Boomers are buying policies for the future, but the policies are also available for older individuals. Unfortunately, when symptoms of dementia start it is too late to buy a policy. What if you’ve done this and funds are not available? Unfortunately there are no easy answers, particularly since many local programs have closed in recent years with local and state government cutbacks. This may be the time for a family meeting to take stock of people resources and financial resources. When you map out a game plan, one family member may be able to contribute a monthly amount for care; another family member may be able to contribute a gift of time. Sometimes friends, neighbors, service clubs, and faith communities will rally to provide support. Education makes a big difference and gives you greater skills to navigate this journey. A family that is proactive and educated can better minimize behaviors that are challenging and may be able to keep a person at home longer. Learn about Dementia Care Services provided by the Home Instead Senior Care® network.